Remember, you are the product, not the customer. I’ve deployed Ninite Pro to update non-Windows applications on computers that I manage. I’m running it in silent mode but I wanted some decent logging so I can review what it did. This is especially useful when run from the MAXfocus dashboard as a Scheduled Task: the output is visible from the dashboard. Param 1 Path to local or network copy of NiniteOne.exe. Param 2 Optional path to a NiniteDownloads cache. This can be on a network share, in which case the MAXfocus agent must run as a user with network access (not as the default SYSTEM account). Defaults to %temp%\NiniteDownloads if not specified. Fails if not accessible. Ninite is run three times: first in /audit mode, then in /updateonly mode, then again in /audit mode. Output is written to the NiniteUpdateSummary.log file in the same folder as the script. “Not installed” messages are omitted, so you get a nice summary of what is installed. When the script completes, the NiniteUpdateSummary.log file is written to stdout (which is what is displayed in the MAXfocus dashboard). Additionally, the full result of the final audit (including the “Not installed” messages) is saved as NiniteAuditAfterUpdate.log. There is a hard-coded variable in the script called CommonParams that excludes Microsoft programs (I use Microsoft Update for those), some other programs that were not updating, and TeamViewer (since that update can clobber the MAXfocus Take Control function). I also set it to /disableshortcuts. You may want to adjust these parameters and exclusions; see the Ninite command-line switch reference and their list of apps. Save this as NiniteUpdate.cmd. For easier reading and editing, open it in Notepad++. See comments in the script re. various updates since its initial release. REM Run Ninite /updateonly on the local computer, optionally caching to local or network path. REM Copyright 2015 by Mark Berry, MCB Systems, www.mcbsys.com. REM Free for personal or commercial use. May not be sold. REM No warranties. Use at your own risk. REM Param 1: Path to local or network copy of NiniteOne.exe. REM Path only; assumes "NiniteOne.exe" for program name. REM to %temp%\NiniteDownloads if not specified. Fails if not accessible. REM Assumes you have administrative permissions on the local PC. REM Creates/replaces NiniteUpdateSummary.log in %ProgramPath%. 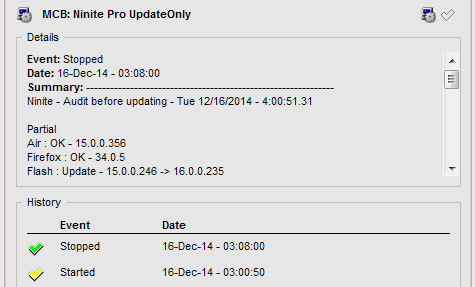 REM 12/13/2014 Modify to create and save NiniteUpdateSummary.log as combined log file. REM Individual Ninite runs write to NiniteTemp.log, deleted after use. REM Final audit saved to NiniteAuditAfterUpdate.log. REM (vendor doesn't allow update) and Messenger (discontinued). 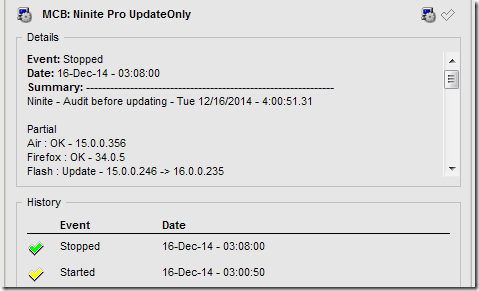 REM 01/31/2015 Exclude ".NET 3.5.2", a new Microsoft program. REM 03/16/2015 Print program and cache path at beginning of NiniteUpdateSummary.log. REM 04/02/2015 Show parameters in log. REM Don't try to write to log if log path (%ProgramPath%) not found. REM folder when no cache location was specified and script was run from Max RM. REM - Set default cache location to NiniteOne.exe folder (param 1) + \NiniteDownloads. REM were passed in double quotation marks. Strip out single quotation marks around parameters. REM Now strip single quotation marks, if any, added by Max RM caller bug. REM Max RM adds a -logfile parameter as the last parameter. Ignore that. echo Program path "%ProgramPath%" does not exist. Exiting. echo Program executable "%ProgramPath%\%ProgramExe%" does not exist. Exiting. if not exist "%CachePath%" md "%CachePath%"
echo Downloads cache path "%CachePath%" does not exist and could not create it. Exiting. REM Send all output to NiniteUpdateSummary.log file. First redirect overwrites previous log; the rest append. echo Program: %ProgramPath%\%ProgramExe% >> "%LogFullPath%"
echo Cache param: %CacheParam% >> "%LogFullPath%"
echo Common params: %CommonParams% >> "%LogFullPath%"
echo Log file: %LogFullPath% >> "%LogFullPath%"
echo Ninite - /audit before updating - %date% - %time% >> "%LogFullPath%"
echo Running first %ProgramExe% /audit failed with ErrorLevel %errorcode%. Exiting. REM Print lines that do NOT contain the string ": Not installed"
type "%ProgramPath%\NiniteTemp.log" | find /V ": Not installed" >> "%LogFullPath%"
echo Ninite - /updateonly - %date% - %time% >> "%LogFullPath%"
echo Running %ProgramExe% /updateonly failed with ErrorLevel %errorcode%. Exiting. echo Ninite - /audit after updating - %date% - %time% >> "%LogFullPath%"
echo Running second %ProgramExe% /audit failed with ErrorLevel %errorcode%. Exiting. echo Exiting with ExitCode %exitcode% >> "%LogFullPath%"